For me journeys are not just about travelling around the world, looking at marvels of nature or mankind, but journeys of the mind. We don’t really know the destination; experience is the journey. It is about perceptions and feelings and emotions and revelations. It is about people and places that enrich and arouse the spirit. Rising above the mush and grime of daily living to infuse it with the spirit’s passion to live another day, breathing in its grace, leaving behind the grudges of yesterday. It’s about looking at the world around you and engaging with it to find yourself through its multitudinous illusions.... at least trying to! A recent train journey that was delayed by about five hours made me realise just how much I would have missed had the train arrived in Delhi, on time. We were supposed to reach Nizamuddin Railway Station around eleven a.m. which meant that all the places we were to have passed in the dead of night were the ones I was awake to look at: the delicately billowing sarson, miles and miles of yellowed fields waking up to their golden hue, reflecting the sun’s passion as it sharpened its rays and more. I spent most of this extended time either searching platforms for a much needed cup of tea or looking out of the train through the lens of my camera. Very much a visitor in my own country, curious about everything that the locals took for granted. In doing this I was no less of a curiosity to them, especially the chai wallahs busy racing up and down the platforms serving tea, while I chased them with my camera. 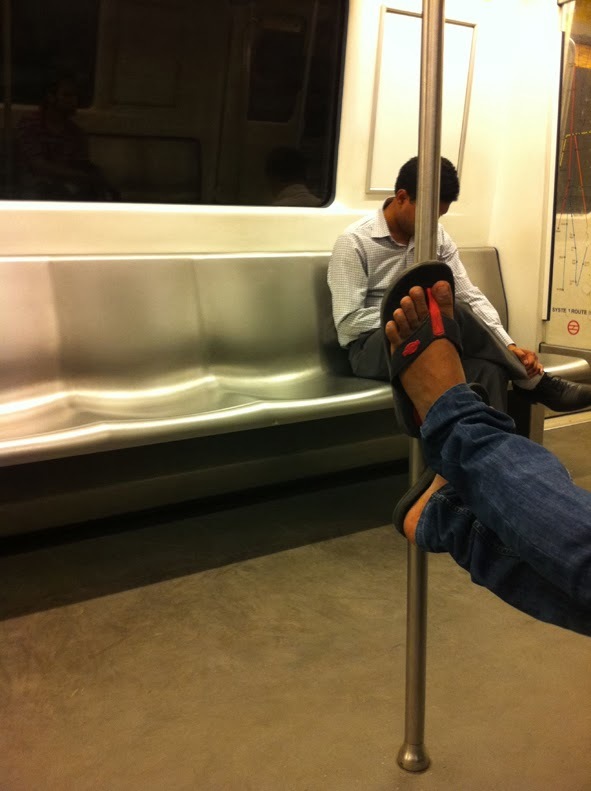 Aditya Dhawan’s collection of photographs on the metro, - Metro-tales as he calls them, remind me of just such a curiosity. In the first image – [he hasn’t named them], a rather solid steel bar divides the frame, virtually in half, vertically slicing a man’s body such that, ironically, it exaggerates his belly. He isn’t fat, but not lean either. The photographer’s focus is on this central figure dressed in a green T-shirt, printed with black letters in English, tucked inside blue jeans, secured with a black belt. He, our Mr. X is carrying a paper bag in his left hand and two more lie on the right side, as if left there so that he could hold onto the hand-stirrups above [which we do not see]. His eyes look blankly ahead – face deadpan, as if in another world, with hopefully, enough attention to ensure he gets off at the right stop. Maybe the bags on the floor of the carriage don’t belong to Mr. X but to the faux-leather-covered arm that arches across the top of the frame. A rather sinister element in this photograph because all you see is the arm. One assumes there is a body attached to it and that it isn’t someone’s severed limb. Almost all the other travellers are in a kind of dark shadow, not because of insufficient lens exposure but because they are mostly wearing dark blue or black. This creates an aura of darkness which, however, is interrupted with the hint of a smile, gingerly peeping through heads and arms - a fellow traveller enjoying a joke perhaps? It’s barely perceptible and though it does lighten the mood, the frame is rather sombre and reminiscent of the socio-political atmosphere of the country at this point in time. I have to confess that, I have not yet been on the Delhi Metro. But having travelled on the underground in various part of the world, I am no stranger to such journeys where everyone, including myself, was just waiting to get off at our designated stations and hardly noticing what was going on, not thinking twice about such everyday scenes. However, Aditya draws my attention to them not because he has captured something apparently significant but precisely because he has not. That is what makes it significant because, in expecting some great revelation, I look and, when I look, I see things that I would otherwise miss. And this is the thing that I love about art: when you look you find yourself in it through the ramblings of the mind. I focus on things I see, and let them speak to me. What did you see in that image? It is, after all, a question of perception. A lot of assumptions come into play and while I saw that happening as I looked, I decided to question them because, in reality, when we assume we actually miss what else could also be going on. The sombre mood, the arm that could be a severed limb, the dark aura because of the clothes and the photographer’s choice of lighting options [did he or didn’t he use a flash and why not?] builds up the mood for something more than the physical dimensions of the scene conjure up. It makes life interesting. In another image we have a child that is clearly upset. Its facial expression – the elongated cheeks, flared nostril, strained muscle on the right side of the neck, the wide open mouth and that look of longing, calling out to someone or for something that has gone out of his/her grasp, the sense of separation –conveys more than just a child’s petulant cry for a toy or comforter. The child appears to be clad in a snug quilt-like outfit, partially unzipped. It’s placed, most likely, on someone’s lap, but without making that assumption based upon experience, going just by what I can see, it could be abandoned and maybe that is why it is in so much anguish? A hand, much larger hand, more than ten times the size of its tiny, exquisitely crafted fingers, touches as if in support. And yet the touch is tentative, there is no clasping of fingers nor does this hand hold onto the arm of the child. A thumb merely touches the sleeve. Would that be the hand of an indulgent mother, letting her child cry its heart out, uncaring of the discomfort of co-passengers? Or, is it an exhausted mother who cannot care at this point, nor really do much in the present situation? Or maybe it is the hand of an indifferent passenger, whose compassion is being awakened upon seeing the distraught, abandoned child. Yes, I am trying not to assume but question. It’s possible that an unseen hand holds the child securely and this is just an innocuous gesture and I am deliberately trying to read meaning into it. But wait, there’s more. We have a view of this child from above. All other bodies are faceless. What we see are shoes, slipper-clad feet, a light-bluish duffle bag resting on the floor and two steel pillars rising upwards from this floor. One pair of feet is shod in white and grey Nike sneakers with the Nike logo signed off in gold. This hint of glitter, which is not gold but a sharp shade of yellow vinyl, is complimented by a sweater in close proximity. It is knitted in an elaborate, geometrically-floral pattern, in black, white and golden ochre. Under the light in the train’s carriage, it sparkled as if embroidered with metallic thread. 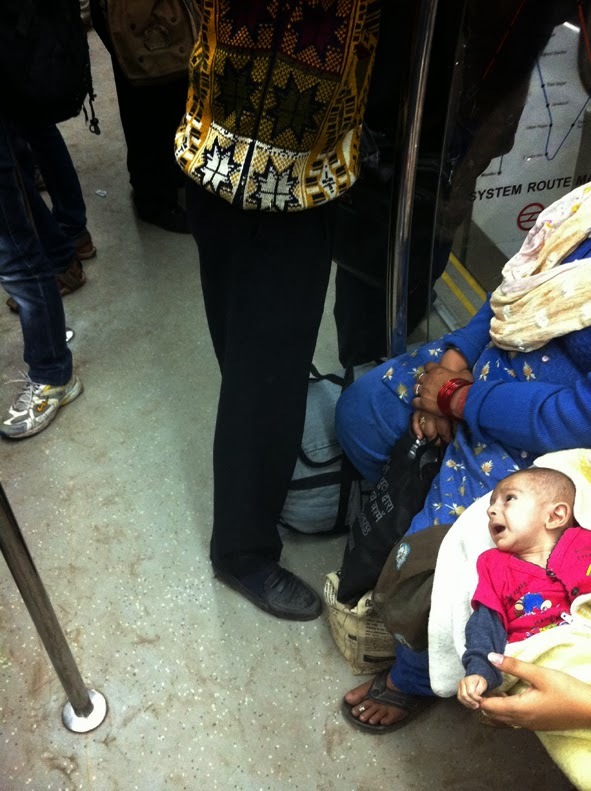 Bags on the floor, back-packs, rucksacks and a woman clad in a blue-flowered, mill-printed shalwar kameez sits beside the child. An ample figure, her hands are clasped in her lap, maroon plastic bangles on a dark-skinned arm holding a black cloth bag. I catch a glimpse of a metro route map on the door of the carriage, partially obscured by passengers hovering close, possibly so they can run out as soon as the door opens at the next station. These are the additional props and figures in this scene. What interest me above all, in this frame, are the dust drawings on the floor. These are not carefully considered drawings executed by skilled draughtsman, but drawn by shoes and slippers as feet swivel the dust on their way through the carriage. I suppose it could be called a performance by travelling companion-strangers, each adding or subtracting from the last foot-print. Their eyes rarely have a role to play in this drawing for they are mostly eyeing available seats, a place to fit their bodies or seeking proximity to the door when their stop is near. I mean, who really looks at the floor? But my attention is brought to this again and again because Aditya’s photographs appear to be not just images of motley of strangers inadvertently travelling together; they’re evocative of the very nature of life and its idiosyncrasies, most especially ways of seeing and the crafting of our perceptions. And besides, his obsession with feet and how they are shod draw my attention to the floor of the train’s carriage. Stilled in time, in that moment, he captures not just an essence but many facets of life that lead from the physical to the metaphysical and back to the physical, quite simply because, he deliberately presents severed limbs, half bodies and two pairs of shoes that belong to three different bodies in a surreal presentation of identity or loss of it, in a crowded metro. The slice of life he presents is abstracted from the physical reality that he sees which makes these Metro-tales evocative of states of the mind - its imaginable and unimaginable capacities. But what intrigues me is that when I try and cut out what I know and just look based on what is in front of me, it really is such an impossible task because then I cannot really define anything. I cannot really tell you what it is that I see. And yet in trying to do this as an exercise, a world of possibilities is uncovered. Krishnamurti says that to know what ‘is’ requires awareness, a very alert, swift mind..... to observe and study but not judge, to be alert yet passive. The next image is priceless from this point of view and I am really grappling for words. The photographer shows us nothing but lower limbs of the human body and a lot of toes. In fact at one point the big toe of two feet that belong to different bodies, come so close that I can imagine them having a conversation – toe speak! In the foreground of this: painted toe-nails, black vinyl slippers decorated with white floral embellishment and toe rings [bichoos] on two adjoining toes emerging from under bright yellow voluminous folds of what has to be a shalwar, defines the gender as female, a married woman. This lower extremity is poised in the air as if the legs have been crossed, knee over knee in a convent-style advocated lady-like fashion, a must for the genteel. The dark skin, well worn slippers, peeling nail polish implies that this woman is not used to indulgent pedicures of the genteel but the convention of crossing legs seems to have percolated through social strata and is standard social behaviour today. In a photographically engineered footsie scenario, another foot stands at an interesting angle to this slippered matron’s foot. An expansive curve forms between the legs. This other limb, grasps between its big toe and adjoining toes, a bright cobalt blue, albeit dusty, Hawai [rubber] chappal and the leg is clad in grey denim which has visible creases of wear. I assume by the stance of the leg and the shape of toes that the wearer is male. The floor in the foreground is also grey and so is the side of the blue chappal. As the eye moves up the leg, the contrast diminishes and the leg almost merges with the grey colour of the floor which has now receded into the background. In between these two legs of opposite sexes, placed together on this journey, that form a veeish curve, there lies something that looks like a black bag. It could be dark grey but actually looks like a lump of something solid and weighty. It is identified as a bag through its metallic accessories of zip and a ring that probably holds the strap. Other details are fuzzy, at least on the computer they appear so. What can such an image and the others before it tell us? Aside from the esoteric idea of looking at the world around us with a sense of wonder but without judgement, at another level what are these Metro-tales really narrating? It’s actually hard to describe the images in words because Aditya has chosen very obscure ways of depicting signs of social change and behaviour patterns where so much westernisation has percolated through the various strata of society, noted through dress-codes and more. An almost obese Buddhist monk, eyes closed, one hand placed on each knee, is wearing sleeveless saffron and maroon robes. The white head phones inside his ears could belong to an i-pod or i-phone, but is he listening to music or meditating on this crowded train? Another man sleeps, and there are tired-looking travellers who choose not to take a nap, someone fiddling with his cell phone, someone talking on one. And, a lone man, in what seems like an empty compartment, who looks as if he has lost his way in life. The prize shot is one taken between colourful bandwallahs, en route to a wedding or on their way back, one of them asleep and another anxiously posing. Is that a selfie? Tell-tales of everyday life depicting the angst of a chaotic society undergoing change both social and economic, peppered with photographic humour of quirky shots featuring of only shoes and various patterns, in stripes and checks on shirts and trousers of male attire, on the metro. 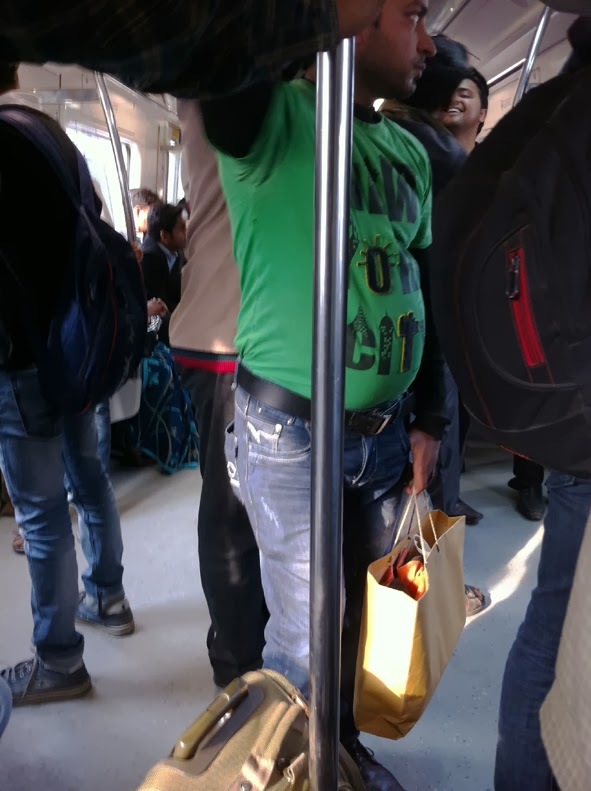 Not to forget blue-jean clad legs in rubber slippers, feet propped up on the steel pillar in front of the seat they occupied, bringing forth the question: would one not see this lack of civic sense, on public transport, anywhere else in the world? It’s a subtle commentary, but that is what is so special about these images. They reveal, in a way, that it is your perception, drawn from your experience and understanding of the world that determines what you see. The photographer takes you on a journey of self-exploration, through the curiosity of your own questioning mind, beyond the obvious, to form an insightful picture of that moment frozen in time. The images capture within their ambit a slice of life where, paraphrasing William Blake, we can see a whole world in the unusual perspective of Aditya Dhawan’s lens. am stopping here for masala chai after a long time and its even better than before, what an organic flavour, the flow easy and natural ! insights of everyday images many but so arresting and all the pieces fall clearly into place in the end ... yummy ! Thank you Johny ML for this link to your own thoughts on these photos. I knew you had written something but deliberately didn't read it as I didn't want this to influence my own musings on Aditya's work. But, now I will take a look. Thanks for stopping by at garam masala chai, hope you enjoyed the post. 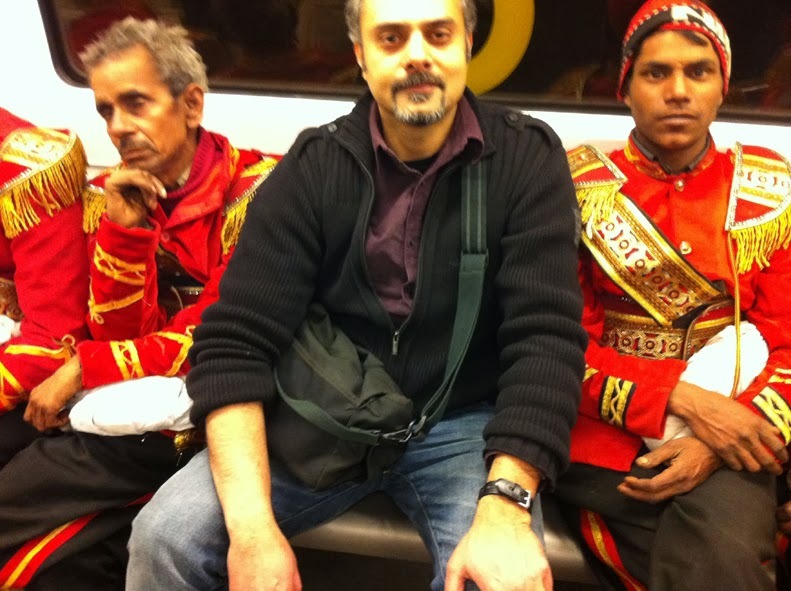 I travel a lot on the Delhi Metro. I love it. It is the neatest, fastest, most eco-friendly journey I have ever had in my life in Delhi since 2000. Gopika, the post was lovely because of the photographs too. I think you caught some moments, especially, playing footsie. I love train journeys too; I de-stress talking to people from different fields of life. The maximum 17 - 18 hours that one spends on a Rajdhani is well spent with many tales from all around. I always keep a low profile and am not very open about who I am and what I do - how does it matter? - Hence, the people around loop me in easily. It is like travelling to another town for just a few hours and getting off at the same destination with everyone else, but never seeing them again. Much love, keep writing, it garam, its masala chai, after all! Thank you Nalini Malaviya, glad you enjoyed my observations - thanks for stopping by. Hope to see you on these pages again soon. Bogie-full of awesomeness! Brilliantly done Gopika. Keep these gems coming!